Located at 1110 S Philadelphia Blvd, the 9,800 square foot center comes to Abra from the acquisition of T&S Auto Body’s business operations in a deal that closed today. T&S has been operating in the same location for more than 40 years, and is known in the community for quality, friendly service, backed by a lifetime warranty. Members of Abra’s leadership team will be heading to Aberdeen in the coming week to welcome the center’s 10 employees to the Abra team. “We look forward to introducing Abra to the Aberdeen community, and continuing our growth in the state of Maryland,” says Jim Kessler, Abra’s Chief Operating Officer. This is Abra’s second location in the state of Maryland; the company acquired a single location in Rising Sun in January 2018. Together, these centers complement Abra’s operations in the greater Philadelphia, Delaware, and South New Jersey areas, as well as help introduce the Abra brand to new communities. At Abra, we recognize that it’s more than just a car. We are a leading provider of vehicle repair services, specializing in collision repair, paintless dent removal, and auto glass repair and replacement, backed by a lifetime national warranty on our workmanship, honored at any of our 397 locations in 28 states across the country. 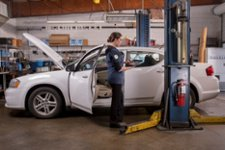 Through state-of-the-art technology, extensive training, reassuring service, and a commitment to repairing vehicles with the same care as if they were our own, our goal is to get customers back on the road quickly and safely. Founded in 1984 in Fridley, MN, and headquartered in Brooklyn Park, MN, we conduct our business based on responsible business practices, including implementing environmental sustainability initiatives, working to protect the health and safety of our employees, and giving back to communities we serve. In 2018, we’re going back to our roots, and the name that got us started: Auto Body Repair of America. For more information, and to find a location near you, visit abraauto.com.